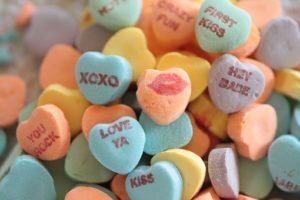 Conversation Heart candies are those sweet-talking, heart-shaped confections that have kids of all ages enjoying the sayings and munching for years. Loads of colors, flavors, and sayings that change from year to year; these candies are over a century old. The New England Confectionery Company (NECCO) began manufacturing these hearts around the year 1902, but the owner Oliver Chase, a Boston pharmacist, began making candies and created a machine to make hearts way back in 1866. These small hearts stamped with fun sayings have become a Valentine tradition. Today, you can find other companies that make these confections too! Why not turn conversation hearts into fun activities for your class to enjoy this month during the Valentine’s Day theme? Here are a few to try. Throughout the years, exchanging valentines has been a popular custom, one that kids look forward to each season. Try this creative activity that continues the tradition with a twist – it will boost a child’s self-esteem as well. Duplicate a heart pattern on a variety of colored construction paper. Give each student one heart for every child in the classroom. Instruct the class to write each student’s name on the front of the heart and then write something “kind" about the person on the backside. Gather these projects and save them for a later activity. Receiving uplifting paper heart messages from classmates are designed to build positive self-images. On Valentine’s Day, you can distribute the hearts to the correct student OR use this project to add to the fun. Why not make life-size paper replicas of each child and then attach the friendly conversation hearts to it? Begin by pairing up your students, each taking a turn to trace a body outline on a large sheet of brown craft paper on the floor. Ask the kids to color in clothing and facial features on their outline. Cut these out and attach the “paper kids" to the classroom wall. 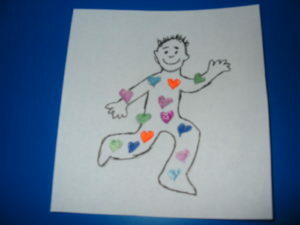 On Valentine’s Day (or that week), allow your students to tape on the “hearts of kindness" on the correct paper doll. 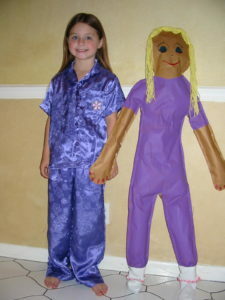 When the holiday is over, each child can take home their own paper doll to share their notes with their families. Wrap your classroom with love by making heart chains. Give each child a sheet of white paper where heart shapes have been previously drawn. Encourage the children to be creative as they decorate the hearts. Think about polka dots, plaids, flowers, glitter, glued on sequins, and so on. Next, make chains by linking strips of construction paper together. Say, approximately 1" by 9" strips. You can either glue or staple the ends, one inside the next. Invite the kids to cut out their creative hearts and glue these to the links. Have the students combine their chains and wrap this large chain around the classroom as a decoration. Use candy hearts as a unit of measurement making a heart ruler. 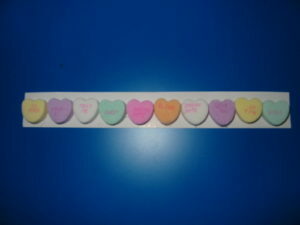 Give each child a rectangle of tag board and have them glue 10 candy hearts, side by side, on it. Use this fun ruler to measure the lengths of objects in the classroom. Think about measuring a book, a shoe, the height of a chair, the width of a desk, and other things. Talk about how many candy hearts the object measures. The teacher will need to prepare the props for this game ahead of time. Reproduce enough conversation hearts so there will be one heart for every two students. Write a cute saying such as, “Be My Friend," “Friends Forever," “U R Nice," “Be Mine," and so on. Cut each conversation heart in two with a jagged line (like a puzzle piece). Place all the halves into a box and mix them up. To play this game, have each child pick up a puzzle piece. At the signal of “Happy Valentine’s Day," have the kids move around the room until they find their classmate with the other half of the broken heart. After all the kids have found their partners, line up the group and have them read the inscription on the heart. My group always wanted to play the game again, so collect all the pieces and start over. So, when Valentine’s week comes along, have these activities ready for your class – and let a handful of conversation hearts sweeten your day. And, it wouldn’t hurt to have some real conversation heart candies to munch and enjoy! Country Living, “10 Things You Didn’t Know About Candy Conversation Hearts"